We have picture of the day, waterfall of the day, grass, my shadow, reflections, FURN2HDR, etc, etc. I searched for a one stop place to post time lapse photography on this forum and did not find it. I've noticed others posting a time lapse here and there, so i think it's time to start a thread on time lapse. So here's a start. If any one know's why flickr resized my video please let me know. Very well done! I might have to try a few of those. Flickr did that because they can, besides that I don't have an answer. Great time lapses too!!! Here's one from a couple of weeks ago. Finally got around to putting it together. Neat! That seemed like a pretty long lapse. Did you sit there for a while? Or was it all remote. That last one is about 45 minutes of time. Yes i do have a remote so i can set up the camera and walk away to do something else. I also have 2 DSLR's A Pentax K10d and a Pentax K7. The remote works on both cameras, however my K7 has an intervalometer built into the camera but is limited to 99 frames. In the latest time lapse i used my K7 with the built in intervalometer, and simply reset it when it reached 99 frames. For the time lapse of the Mt Pilchuck look out, and the sunset from Mt Pilchuck i packed both DSLR's and two tripods. The K10d was set up on the remote. While i still had my K7 free to walk around and take photos. I probably could have had both of them set up doing time lapse at the same time. One other thing...my K7 is capable of doing in camera HDR that is it will automatically shoot 3 photos, and blend the exposures similar to Photomatrix. The built in intervalometer is disabled in HDR mode...but i should be able to use the remote control and run a HDR time lapse. I have not tried it yet, but when the conditions are right for it i'll give it a try. On that last one of 45 minutes what was the frequency of shots? That's interesting work there. Thanks! Crater Lake, just a few shots slowly dissolved. 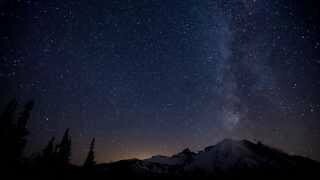 Check out this great timelapse of the meteor shower above Mt. Rainier. Go to You-tube to view it HD full screen. That's very cool and impressive. Is that yours? I bought a D300s and i made this trying it out in my front yard last night.